Joan Kowal, senior director of energy strategy and utilities for Emory’s Division of Campus Services, accepts the 2018 IDEA Innovation Award for the WaterHub at IDEA's 109th Annual Conference and Trade Show on June 13 in Vancouver, BC. Photo courtesy IDEA. Emory has been recognized by the International District Energy Association (IDEA) with the 2018 IDEA Innovation Award for the WaterHub, an award-winning facility that reclaims and reuses campus wastewater. 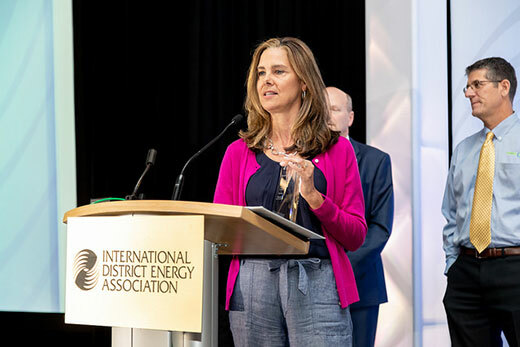 Joan Kowal, senior director of energy strategy and utilities for Emory’s Division of Campus Services, accepted the award June 13 on behalf of the university at the 109th Annual IDEA Conference and Trade Show in Vancouver, British Columbia. The IDEA Innovation Award is an annual competition that began in 2015 to recognize achievements in energy and water savings and collaboration among IDEA member systems and business partner technology providers. The intent of the award is to bring visibility and awareness to projects that have potential for widespread application and replicability that may reduce energy use, enhance efficiency or strengthen reliability. “IDEA is pleased to recognize Emory University, along with its technology partner Sustainable Water, for their achievement of significant reductions in potable water use,” said Rob Thornton, president and CEO of IDEA. Launched in 2015, Emory’s WaterHub utilizes an ecological treatment process to clean wastewater for non-potable uses on campus. Developed in partnership with Sustainable Water, the facility provides a low-energy, high-efficiency cleaning process through filtration, circulation through natural earth and plant bioreactors, and exposure to ultraviolet light and chlorination. The first system of its kind installed in the U.S., it has drawn both international attention and widespread accolades. Since its installation, the WaterHub has displaced more than 160 million gallons of municipally supplied potable water, allowing the university to use reclaimed water instead to satisfy almost 100 percent of the campus’ utility systems operational demand, including Emory’s chiller plants and the central campus steam plant, which provide heating and cooling to over 70 buildings. The WaterHub also serves as a catalyst for academic research and community outreach. As a living, learning laboratory, it serves as a classroom for students and a platform for hands-on research. For information about how to take a tour of Emory’s WaterHub, visit here.